Spotted are among the smaller species of turtles. The carapace (shell) is smooth and dark, though peppered with yellow spots. While the head is mostly dark, the face has lighter coloration and a few spots. Males and females differ in appearance (they are sexually dimorphic). Males are more elongated, with larger tails. Females have rounder carapaces and are, overall, slightly larger than males. 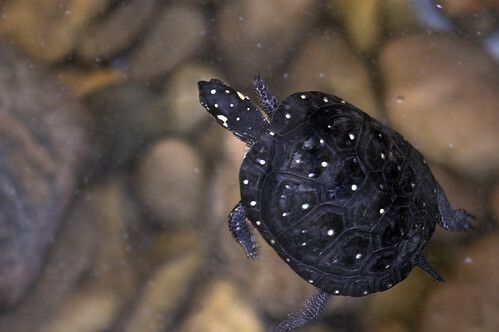 Spotted turtles reside in discontinuous portions of eastern North America, including pars of the Midwest (including Illinois), the Eastern Seaboard and the south. Populations have been recorded in Quebec and Ontario. As habitats preferred by spotted turtles disappear, the species dwindles. Populations are increasingly small and isolated. Spotted turtles are considered vulnerable. This species prefers shallow waters with soft substrates and vegetation, from ponds to swamps to muddy streams. Spotted turtles can be found wandering on land in search of bodies of water. After hibernating over winter, spotted turtles become active in the early spring. (Their activity slows in the hottest part of summer, when they may burrow into leaf litter or water to remain cool.) They eat plant and animal foods, from aquatic seeds and greenery to worms, amphibian eggs and carrion. 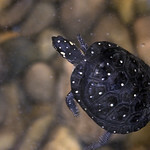 Being small, spotted turtles are vulnerable to predation, particularly when on land, where they fall prey to raccoons. Adding to this species' struggle in their dwindling habitats is the long time it takes individuals to reach sexual maturity, about a decade after birth. They begin courting and mating in the spring, when males will battle for access to females. Courtship entails chasing the females underwater, snapping at their legs. Breeding takes place in shallow water. Females normally lay one clutch annually, containing as many as eight eggs, in open areas of soil. Females dig nests in which they deposit their thinly shelled offspring. Hatchlings emerge in the fall. Temperature dictates spotted turtles' gender. During the middle stage of the incubation period, the temperature of eggs in the nest alters development, with cooler temps producing males and warmer temps producing females.